eEURHAB Center of Competence for Rhabdoid Tumours (M.C.F. ), Children's Hospital Augsburg, Suabian Children's Cancer Center, Augsburg, Germany, and Department of Pediatric Hematology and Oncology, University Children's Hospital Münster, Münster, Germany. SUMMARY: Destruction of the bony structures of the skull is rare in primary tumors of the CNS. In low-grade gliomas, modeling of the skull is caused by slow growth and chronic pressure. Bony destruction is exceptional even in highly malignant gliomas. Atypical teratoid/rhabdoid tumors of the CNS are highly malignant neoplasms diagnosed with an increasing frequency, mainly in young children. On imaging, these tumors exhibit distinct though not specific morphologic features including peripheral cysts, bleeding residues, and a distinct bandlike, wavy pattern of enhancement. A combination of these single characteristics together with a predilection for young age is suggestive of an atypical teratoid/rhabdoid tumor. We present 5 children with an atypical teratoid/rhabdoid tumor affecting the adjacent bone. These 5 patients were collected in our imaging data base for childhood atypical teratoid/rhabdoid tumor consisting of 91 children at the time of this evaluation and thus representing 6.6%. The mean age of children with bone involvement (4.8 years) was above the average age (2 years) of all children in the data base. We add this rare feature to the list of typical features in MR imaging and CT morphology of atypical teratoid/rhabdoid tumor. We report 5 children harboring an AT/RT with skull or skull base involvement. This rare phenomenon may add more specificity to the already present list of imaging characteristics of AT/RT. The patients presented in the current report were collected in the National Reference Center for Neuroradiology for the German Brain Tumor (HIT) Trials, conducted in German-speaking countries of Europe. At the time of evaluation, the data base contained 91 patients diagnosed with an AT/RT. Imaging files sent to our center come from more than 100 treating institutions and are collected within multicenter studies. According to this multicenter basis of data acquisition, no uniform MR imaging protocol was applied. With the consent to participate in the trials of the HIT network, parents or patients agree to the data transfer to reference institutions. Compared with the whole group of children with an AT/RT in our data base, the 5 children presented here were older (mean age of 2 years in general; our cases, mean age of 4.8 years). 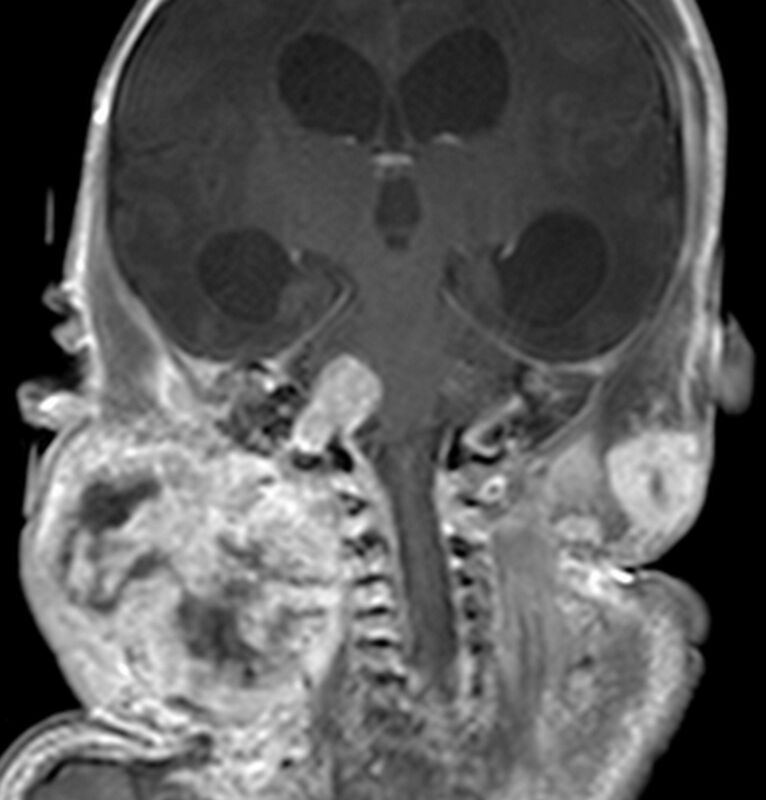 The 9-year-old girl presented with double vision, abducens nerve paresis, and papilledema. On MR imaging, a large tumor in the right frontal lobe was detected. The tumor demonstrated a continuous spread into the local leptomeninges but no distant leptomeningeal dissemination. The CSF was positive for tumor cells. On MR imaging and on CT, an infiltration and erosion of the overlying skull was evident (Fig 1A, -B). The patient underwent intensive systemic and intraventricular chemotherapy (Dana Farber Cancer Institute protocol14) and craniospinal irradiation. Six months after diagnosis, multiple brain lesions developed and an infectious complication was suspected. Biopsy of one such lesion remained inconclusive, and the patient died after local tumor progression 16 months after diagnosis. A, Circumscribed right frontal calvarial destruction on a CT in bone reconstruction mode. B, Inhomogeneously enhancing right frontal tumor showing a destruction of the inner table of the skull comparable to A. 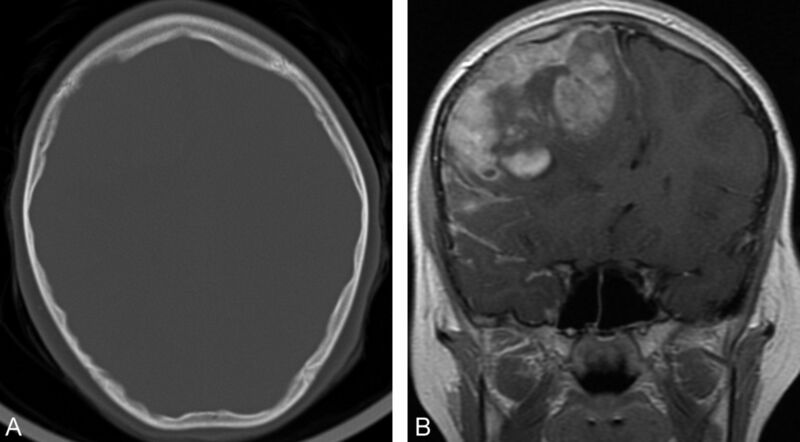 The 3-year-old girl presented with a huge left hemispheric tumor without leptomeningeal dissemination (Fig 2). A partial resection was performed, and chemotherapy was started. After 3 blocs of chemotherapy and before a planed stem cell transplant, the tumor progressed locally, and, after palliative treatment, the child died 6 months after diagnosis. Contrast enhanced axial T1-weighted MRI showing a huge left hemispheric tumor with invasion of the skull and subfalcial herniation. 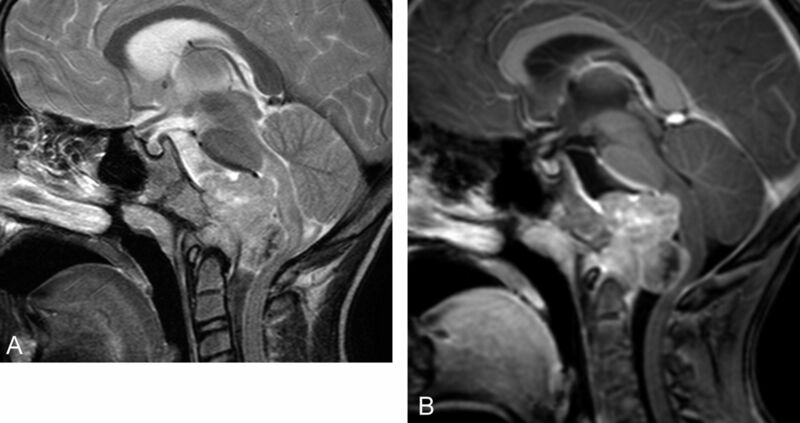 On intrauterine MR imaging 2 days before delivery, hydrocephalic ventricles and a lesion in the right temporal lobe were seen (Fig 3). MR imaging was performed because high-risk sonography had demonstrated macrocephaly prenatally. At birth, the boy showed intracranial tumors and multiple nodules within the muscles and soft tissues of the neck, trunk, and extremities. The spleen, kidneys, pancreas, and adrenals were also affected. A biopsy of a mass affecting the upper extremity revealed a malignant rhabdoid tumor and the suspicion of synchronous rhabdoid tumors. A prognostically unfavorable rhabdoid tumor predisposition syndrome was diagnosed. After palliative chemotherapy the boy died at the age of 3 months. Coronal T1-weighted MRI after contrast showing a huge mass at the right side of the neck and an intracranial tumor with extension to the temporal bone. A smaller extracranial soft tissue tumor is seen in the left side of the neck. The 5-year-old girl showed an extra-axially growing tumor in the cerebellopontine angle on the right side, with infiltration into the internal auditory canal (Fig 4). Preoperative hearing loss in the right ear remained unchanged after resection. The tumor was nearly totally removed, and treatment with chemotherapy and radiation therapy was completed. At the time of this evaluation, 2.5 years after diagnosis, the child is alive without disease. A, Bone CT shows destruction around the internal acoustic canal on the right side. B, This tumor would resemble a vestibular schwannoma if not for the bony destruction on axial post-contrast T1 and previous CT in A. The 7-year-old boy was diagnosed after development of nuchal pain, sickness, and general weakness. Because of destruction of the clivus and despite the low T2 signal of this tumor on initial MR imaging, a clivus chordoma was suspected (Fig 5). Biopsy revealed an AT/RT. He died 8 months after unsuccessful chemotherapy. A, The tumor partially destroying the clivus has a relatively low T2-signal rendering a chordoma quite unlikely. B, T1-weighted contrast enhanced sagittal MRI with a lobulated solid tumor extending out of the clivus and the craniocervical junction. The dura is thought to be a natural barrier for glioma extension, rendering bone infiltration a rare event in primary brain tumors. 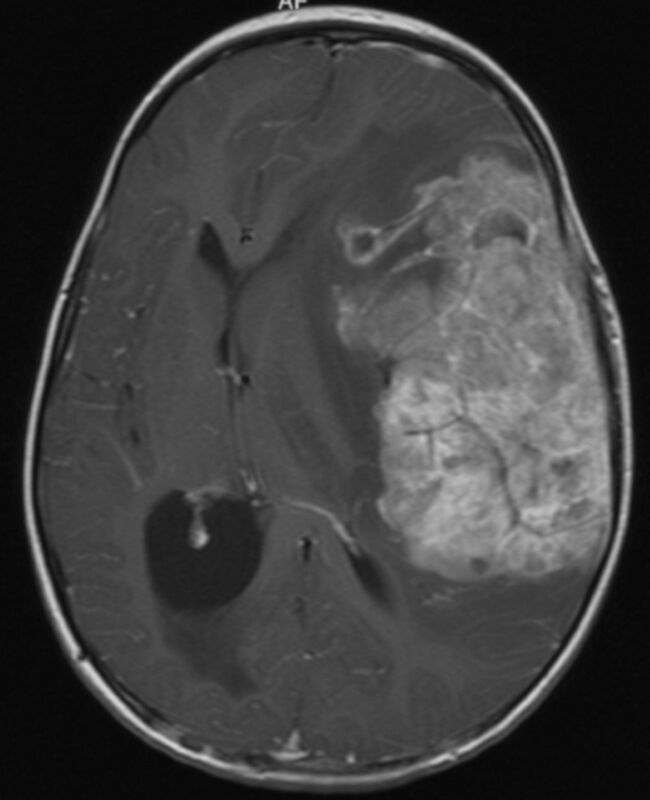 There are only individual reports on highly malignant gliomas demonstrating growth through the untouched dura leading to calvarial destruction1,3–5 and tumor extension through the skull base into the orbit or the mouth.15 Although hematogeneous tumor spread, most frequently to the skeleton, is a rare but well-known finding mainly in the follow-up of medulloblastomas and very rarely in gliomas, virtually no reports on a destruction or invasion of the adjacent skull in medulloblastomas or CNS primitive neuroectodermal tumors exist. AT/RTs are highly malignant tumors of childhood. After definition of this entity,6 this tumor has been diagnosed with increasing frequency. On histopathology, rhabdoid tumor cells exhibit typical morphologic features. However, these defining cells are not found in all tumor parts, leading to problems in the discrimination of AT/RT from other embryonal tumors, for example, CNS primitive neuroectodermal tumor and medulloblastoma. The frequent loss of the nuclear protein INI1/SMARCB1 has become state of the art for the diagnosis of intracranial rhabdoid tumor, AT/RT.16,17 Among the tumors in children below 1 year of age, AT/RT is now found nearly as frequently as CNS primitive neuroectodermal tumor/medulloblastoma.7,18 Rarely, adults are diagnosed with AT/RT, which in this age group are mainly supratentorial, in contrast to young children, in whom infratentorial tumor location predominates.18,19 In addition to the high cellularity of the tumor reflected by low signal on T2-weighted and ADC images,20 bleeding residues, peripheral cysts, and a distinct pattern of contrast enhancement have been described as frequent findings.11–13,21 Rare reports of patients affected by AT/RT demonstrating involvement of the skull in children and adults exist.11,19 Two children with AT/RT of clival location (similar to our patient 5) have been described, whose radiologic appearance also led to the suspicion of chordoma despite very low signal on T2-weighted images.22,23 Indeed, in our patient, the possibility of “poorly differentiated chordoma”24,25 was also discussed during neuropathologic evaluation but rejected in favor of AT/RT, because the tumor lacked any convincing chordoid differentiation. Patient 3 does not completely fit with the other cases because he probably had multifocal malignant rhabdoid tumors of the body in addition to the probable AT/RT. Histology was not performed on the intracerebral tumor but on a peripheral tumor and revealed malignant rhabdoid tumor. The tumor leading to destruction of the petrous bone also grew outside of the skull. Therefore, we cannot exclude the possibility that this was indeed a peripheral rhabdoid tumor extending through the skull base into the brain. The differential diagnosis of bone-eroding gliomas and AT/RT may be impossible, especially when the more frequently observed features such as cysts, bleeding residues, and very low T2 or ADC values are missing. The frequency of 5 of 91 patients with AT/RT with involvement of the skull (6.6%) appears to be high enough to exclude the possibility of a random phenomenon and is in line with reports of AT/RT showing calvarial or skull base affection. We thus add another extraordinary imaging feature to the existing ones to facilitate the diagnosis of AT/RT. This work was supported by the Deutsche Kinderkrebsstiftung (German Childhood Cancer Foundation). Disclosures: Monika Warmuth-Metz: RELATED: Grant: Deutsche Kinderkrebsstiftung German Childhood Cancer Foundation (Parents' association),* Support for Travel to Meetings for the Study or Other Purposes: Deutsche Kinderkrebsstiftung German Childhood Cancer Foundation; UNRELATED: Board Membership: Roche, Grants/Grants Pending: Deutsche Kinderkrebsstiftung German Childhood Cancer Foundation*; Travel/Accommodations/Meeting Expenses Unrelated to Activities Listed: Deutsche Kinderkrebsstiftung German Childhood Cancer Foundation, Brigitte Bison: OTHER RELATIONSHIPS: My position is paid by the German Children's Cancer Foundation, which is a parents' association collecting money to support all scientific activities of the German HIT Studies. Martin Hasselblatt: RELATED: Grant: Interdisciplinary Centre for Clinical Research, University Munster,* (*money paid to institution). Accepted after revision January 15, 2013.